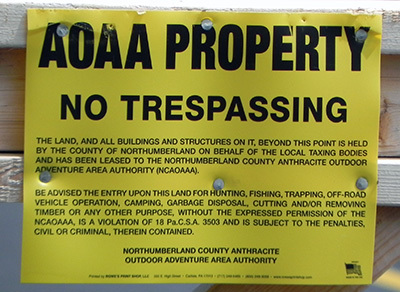 The Anthracite Outdoor Adventure Area (AOAA) is a 6,500+ acre (over 10 sq. mile) park which is under development primarily on coal scarred county owned land, in Northumberland county, PA. The reported plans include camping, hiking, biking, and horseback riding facilities plus motorcycle, ATV and full size off-road trails at the park. Phase one is near completion and partial operations are to commence on their official opening day scheduled for May 17th 2014. Surprisingly as of May 11th there is not yet any signage in place to mark the entrance, and the entrance road itself was barricaded, complete with dire threats of action against would-be trespassers, aimed no doubt at unwitting county taxpayers whose money made this whole extravaganza possible in the first place. This is a somewhat different scene from the one witnessed last weekend, when those arriving to stage a peaceful protest over access rights to the property were met by the intimidating presence of excessive numbers of heavily armed state police in full riot gear. How does the county benefit from the park? Are environmental laws being enforced during its construction and use? What, if any, discounts will county residents be given? Will the promises of future plans allowing hiking and hunting, for example, be realized so that county residents can continue to use the land in the way which they used it before the creation of the AOAA? How is the 5-man AOAA board (personally chosen by county commissioners Bridy and Clausi) held responsible to the county tax payer? Commissioner Rick Shoch has distanced himself from many of the proposed regulations surrounding use of the park. Local conservationist David Kaleta Sr. made headlines in the local press thanks to his strenuous efforts, aided by local attorneys Kymberley Best and Timothy Bowers, to preserve public rights of access to the area – an area where he has been personally responsible for successful efforts to clean up the environment, moving tons of trash and planting thousands of trees – efforts which appear to have received minimal acknowledgement from commissioners Clausi & Bridy. Mr. Kaleta has succeeded in getting under the (admittedly thin) skin of Commissioner Clausi with his vocal opposition to the park: so much so that there is litigation pending regarding Clausi’s treatment of Kaleta at county commissioners meetings. Kaleta has obtained a preliminary injunction in county court but the County and Clausi have refused to settle and have launched an appeal to Federal court at county taxpayers’ expense. 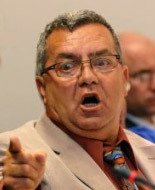 Just how low is commissioner Clausi willing to stoop to quiet the opponents of the AOAA park? Who initiated the grossly intimidatory tactics against what had been advertised as a peaceful protest by 45 people, calling for 20 State police officers with riot gear, on top of local township police and 26 AOAA facility staff? Why did the News-Item apparently chicken out from proper coverage of the event, resorting instead to a poorly written piece which succeeded only in ignoring the issues while ridiculing the aims and commitment of the protesters? The maintenance of a free country depends entirely on its residents exercising their rights as outlined in the Constitution and the Bill of Rights, in concert with a free and honest press. The handling of the AOAA protest shines a light on the breakdown in every one of these necessary functions. While the complaint the AOAA protesters cite is a geographic over-reach of government, I will cite my own – economic over-reach. Governments know how to do one thing well- go bankrupt. Of course governments are not dissolved when they run out of money. When governments go bankrupt they just increase your taxes. What are the odds that this park will show a profit? The same odds that your taxes will be reduced. That is what profit is. Profit is what is left after expenses are met. Government has no idea of this concept. Never has, never will. I believe that the outcome with the highest odds is that after the grant money is spent on patronage jobs for the well connected, and some excuse to tap the coal under Rt 125 is found by perhaps installing an ATV underpass, that the park will quietly fold. I hope to be proven wrong but history is on my side. Anyone want to buy a ski resort? The most embarrassing aspect of the AOAA park is the treatment of those opposed to it. From Vinnie Clausi banging his gavel to silence public input at the county meetings all the way up to last weekend, the treatment of dissenters has been hard to watch. For example, the coverage by the News-Item on May 4th. For starters, the News-Item obviously looked over the protest’s Facebook page, and yet failed to mention that there were numerous references to would-be protesters driving by and not stopping because they did not want to be amongst the extreme level of police presence on the site. I reiterate that this nail, found on a mountain known for the dumping of construction and other waste, “may not have had any connection to the planned protest.” So what the Chief is saying is that he has virtually no evidence to even suggest what he just suggested. Why doesn’t he just say that he spent the rest of the afternoon on the mountain looking for the sniper’s nest? 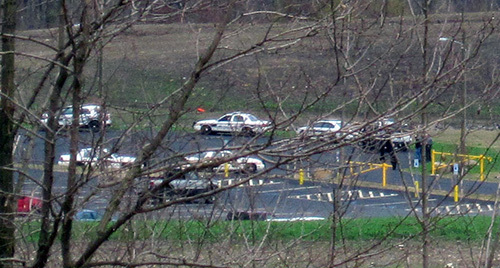 To be consistent in their defense of their paranoid over reaction, why don’t the police waste another couple thousand dollars of tax payers money to search the entire 6,500 acre park for land mines? These are the ideas planted by such inappropriate remarks. The assigning of one policeman for every two protesters shows the arrival of the Police State to our own back yard. Such a show of force sends the message that all protest is unbelievably dangerous and warrants this, what is in fact, a ridiculous over reaction. A couple of thousand bucks down the tubes because tyrants are afraid of a Facebook event with 45 people attending. The taxpayers should be outraged at the waste incurred to protect the AOAA organization from free speech. This country has been witnessing an ongoing slide in the people’s ability to dissent, and there is no better evidence of it locally than the actions surrounding the AOAA park. For the News-item to imply that those seeking to exercise their right to use a bullhorn and carry a poster board are the problem in what is supposed to be a free country is, to me, despicable. An honest article on the protest would have mentioned the intimidation aspect, and the excessive costs the tax-payer incurred in order to deliver it. Perhaps the News-item has come to love Big Brother and the Police State. I call on everyone involved to be more professional, and respectful of each other, especially our God given and blood fought rights as Americans to free speech.